Four P's In A Pod: Wormy Returns! The family that lives in the Big Blue House on the Shores of Lake Superior were stunned on Sunday to find that Wormy had returned. Wormy had enjoyed a long absense from the Big Blue House. 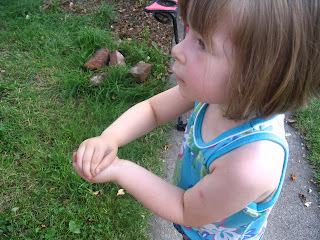 However, while gardening, the oldest family member along with the two youngest members found Wormy once again. "Wormy has changed slightly in the time that he has been away", stated Momma. "Wormy used to be slightly metallic and live on my wrist when he was not being played with. I suspect that this Wormy is an impostor." However, one of the younger family members insisted that this was in fact, Wormy. Wormy was enjoying a siesta under a garden ornament when he was rudely taken from the soil in which he lives. 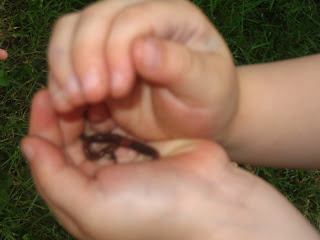 The young family member was quite gentle with Wormy and insisted upon carrying him every where he went. A quick picture was taken to commemorate the occasion. Plans were made to celebrate all future holidays with Wormy. There was also talk about making a special place for Wormy in the house. 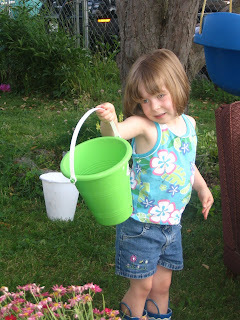 The family then decided to put him in a bucket "all his own." In a surprise move, one family member dumped the bucket into the sandbox where the 2 young members quickly decided to make Wormy safe by piling sand on top of him. A rescue mission was later undertaken by the same 2 alleged troublemakers, however Wormy was not found. Any leads may be sent to the Big Blue House Investigation Unit. 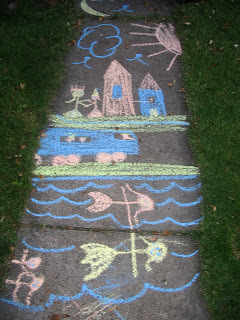 In other news today, a mural was drawn on the sidewalk depicting the life and times of the Big Blue House on the Shores of Lake Superior. From top to bottom you will see an airplane, the moon, the sun, birds, two princesses (one big sister one little sister princess), a city, a subway complete with 2 princesses riding, a river with 2 princess mermaids and their much smaller parent mermaids. Plans to save the mural forever were crushed Tuesday night during a thunderstorm. No plans have been made for reconstruction. AJ would like to invite the princesses at your big blue house to join him sometime at the "castle museum" (Children's Museum), though I suspect no worms are allowed. Last night AJ announced, "I can be the knight, and Addie can be the princess and Lily can be the king, and Mommy can be the Joker, and Sydney can be the princess, too." I used to be queen. I wonder what happened?